This building was originally constructed to house a gasoline filling station, car storage garage, and five storefront shops. It was completedin the summer of 1927. Advertisements in the Venice News, the local paper, state that it housed the repair shop and the Sinclair Gasoline & Oil station of J. Harris Jones. During the 1930s, it was used by the Kentucky Military Institute (KMI) as an armory, chapel, and basketball arena. KMI had an excellent basketball team and there was a spirited rivalry with local schools. These exhibition games were well attended and were a draw for the community during the winter. 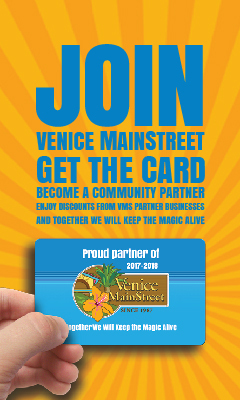 In 1972 following the demise of the KMI, the building was purchased by the community based Venice Little Theatre organization and remodeled as a performance venue. In 2008 the Venice Little Theatre became the Venice Theatre. Among the country’s 10,000 community theaters, the Venice Theatre is ranked #1 in the country for towns the size of Venice and #3 in the country for towns of any size.